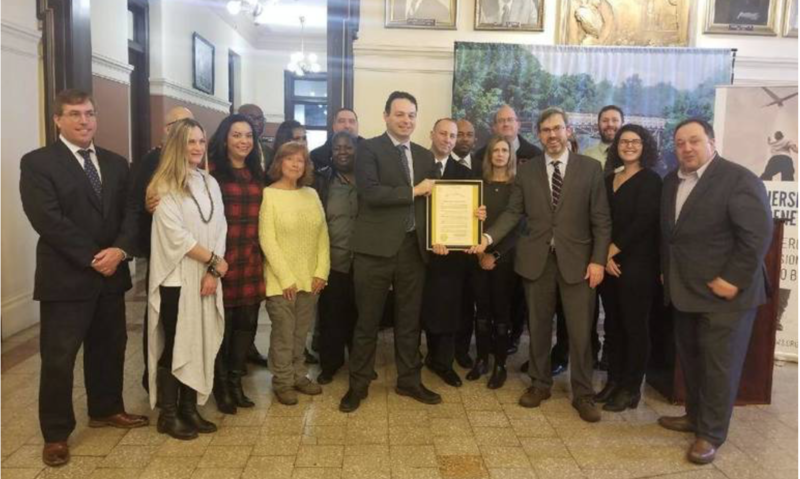 Paterson, NJ – Several dozen people gathered at City Hall on Monday, February 4 to show support for the electrification of New Jersey’s transportation system. The event, organized by Jersey Renews in partnership with the Amalgamated Transit Union, brought together a diverse assembly of speakers to address how accessible public transportation run on clean, renewable energy can reduce air pollution, promote healthier communities, create jobs, and address climate change. “More investment in public transit will give every person in every neighborhood regardless of age, race, class, gender, or disability the right to safe, convenient transportation at an affordable cost,” said Ray Greaves, Chairman and State Business Agent for ATU NJ. Nearly 50% of greenhouse gas emissions in New Jersey come from the transportation sector. Pollution from so many cars on the road, especially during rush hour where thousands of cars are idling at once, can seriously increase your risk for lung and heart disease like asthma and cancer, and can exacerbate existing conditions. Unfortunately, there aren’t always good alternatives. “Now that transportation is the leading contributor of greenhouse gas emissions in New Jersey, we must incorporate EVs into not only the personal vehicle market but the state’s public transit fleet as well. NJ Transit is the largest statewide public transportation system in the nation and serves 74% more passengers via bus service than rail. While the state is undertaking the Herculean task of reforming NJ Transit, concentrating on its fiscal health and internal structure, the agency must also focus on minimizing the negative environmental impacts of its fleet,” said Janna Chernetz, Deputy Director for Tri-State Transportation Campaign. But our urban transit systems have grown far worse in the past decades. NJ Transit has struggled with underfunding and misallocation of funds for years as the infrastructure began to crumble and service was reduced. Along with reduced services came higher costs – all of which discourages ridership among workers of all stripes. To reverse this trend, NJ Transit needs to be adequately funded – and not on the backs of riders. Public transit fares should be fair and accessible to people of all income levels. By guaranteeing affordable public transit, New Jersey can encourage ridership and engage in one of the most effective strategies to reduce emissions. Public transportation produces less greenhouse gas emissions per passenger mile than single-occupancy vehicles and one person switching to public transportation can cut carbon emissions by more than 4,800 pounds per year. This is why it is essential that public transit is accessible and affordable for everyone. By using public transportation, even without electrification, we can support efforts to cut emissions and protect the environment. This effort far exceeds other household energy saving activities. Investing in public transit creates healthier communities, as riders walk to and from bus stops and trains and helps combat the growing problem of traffic congestion plaguing cities across the country. “The movement to electrify our transportation fleet in New Jersey is the epitome of transit equity. No one – whether it be a driver, passenger or pedestrian – should be forced to breathe in toxic diesel fumes, whether they live in Paterson or Piscataway. Electric transit buses are a reality in the largest cities in America and we need NJ Transit to commit to move forward to electrify its bus fleet,” said Doug O’Malley, director of Environment New Jersey. “The benefits of electrifying our public transportation systems are numerous and impact our communities in every way beyond just the positive environmental and economic impact. The dangerous levels of air pollution from diesel buses harm our residents and hurt our families. New Jersey residents need affordable, safe, and reliable alternatives to promote good green jobs, but to also protect health of our children and families,” said Analilia Mejia, Executive Director of New Jersey Working Families. New Jersey is one of the largest automobile markets in the country. Light-duty automobiles, like a standard family car, are the dominant source of transportation emissions, but heavy-duty vehicles like diesel trucks and buses are also a significant source of emissions. Every traveled mile converted to electric is 70% cleaner than a gas-powered mile. 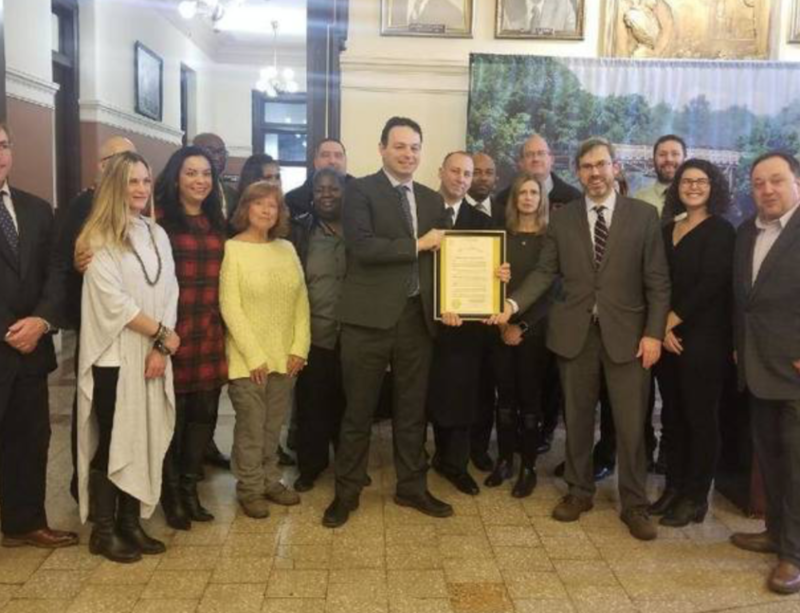 New Jersey has taken steps to become a leader in EVs by being the first state to adopt a Clean Cars program through the Legislature which mandates aggressive growth. The omnibus bill S2252, making its way through the legislature now, takes a strong stance for personal electric vehicles through investment in infrastructure and rebates. But additional state investment in electric charging infrastructure and electrified mass transit is needed to push New Jersey to the front of the pack on air quality and greenhouse gas emissions reductions.